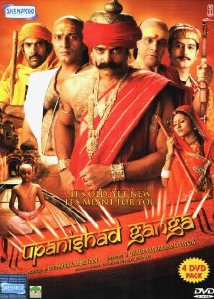 Episode #2 of Hindi TV Serial Upanishad Ganga is titled as Think (in Hindi the title is Prashna Karo. It refers to the greatest attribute of Hindu culture in the root, in order to know the answer one should question! Be it a small stuff, even negligible or be it the toughest situation one can think of, without raising questions in mind, without paying thoughts on the matter, one can never find answers to that!!! We often refer Shrimad Bhagvad Geeta (aka Geeta) as one of the most precious treasure of knowledge the mankind ever have, in a summarized format; is nothing else but a questionnaire. Arjun raises his doubts through his questions and Krushna (aka Lord Krishna) answers those to clear his vision. The Q/A session remains continue till Arjun’s mind is all clear and he have no doubts left in his mind. We human beings are gifted with one of very special organ (can we say that?) – the mind. We can think, we can analyze. With the help of our mind, we can use our brain to the extent we can and wonder through the treasures of knowledge; and even document that for the future generation! Simply incredible ability of us, we must say! Through the characters of Pt. Gaurishankar and Narendra (along with the supportive characters) this episode try exploring the Upanishad and its content. And that is why it is started with the precious words – हिरण्यमयेन पात्रेण सत्यस्यापिहितं मुखम्। तत्त्वं पुषन्नपावृणु सत्य धर्माय दृष्टये॥ Meaning: O Sun God, The Golden Vessel has concealed the Truth within, open it for me so I can explore it! We see that both Gaurishankar and Narendra have their own vision and take for the current situation and the possible place of the language – Sanskrut (aka Sanskrit) and the ancient documents written in it. The views are conflicting. Yet when Narendra is going for his work (preparing for the theater play) he pays his respect to his mother and even his father. Now this is one of the most essential scene of the episode we can say. This 5 seconds on the screen tells a lot. Having conflicting views doesn’t make us enemies, nor we can ever think of not paying respect to the elders. Of course, the parents are the reason we do exist. They did everything for us to make us the person we are. They tried definitely to make us better human beings and provided us the better facilities then they grew up in! Current when we see material happiness and life style taking over, it bring its own problems. If we follow some essential attributes of well cultured society, we can have a better life and time for sure. We see that Narendra’s play and Gaurishankar’s lecture session both are running parallel, at different places. The editing is really good here. It convey the message clearly (without telling) that, may their vision and paths are different, Gaurishankar and Narendra are doing the same thing! The question they raises are quite similar but they raise in a different way. Gaurishankar tells it in philosiphical way and Narendra represents them dramatically. The first approach is better to understand for those who are mature mentally and possess the knowledge and experience; the other approach is attractive for almost all. We all love to see the drama, hear stories and the things which are appealing. It is quite the same philosophy used in the creation of PanchTantra. The question they raise are basic yet philosophical, they are simple yet can lead you (through answer) to the hidden truths of the time and universe! Rather than mentioning those questions, we insist you to watch them. The dialogs in these scene are really excellent. The writer deserves the appreciation for sure. It follows by the dramatization of the battle of Mahabharat (aka Mahabharata) with a different approach. And it starts with – Shrimad Bhagvad Geeta – of course. Though we feel that the answers to the initial questions asked by Arjun to Krishna, could have written better; the Aham Brahmasmi! comes in pretty good way. The summary of the play is fantastic. These dialogs are not to be missed! There is even more in the episode, but leave it for the viewers. The background music plays a very effective role in dramatization of anything and it is convincing here. The body language of the lead actors is really convincing. The title track could have been better. The editing is first rate. The dialogs are first rate and most of the scenes are written in convincing way. The integration of traditional dance-plays may not appeal everyone. The wardrobe is authentic and the people behind that took care of small things as well, for example you see no ear-rings or nose-ring wore by Gandharai when she was scolding Lord Krishna for let this brutal battle happen! The digitization and cinematography leaves a good impact. In fact the DVD quality is really good. Our personal verdict: It is exceptional stuff with good content and one must watch it.